Modern commercial air conditioning systems have revolutionized the way we live. However, combining high-quality air conditioning products with high standards of service has become critical to achieving the ultimate indoor comfort, true energy efficiency, and excellent system performance in different industrial and commercial applications. Because Copeland AC commercial compressor designs come with a variety of innovative features, which guarantee excellent performance, extended durability, superior efficiency, quiet operation, ease of use, and simple diagnostics, any industrial, public, or commercial facility can rely on them for reliable operation, in full- and part-load air conditioning applications. This is one of the reasons why Compressors Unlimited carries a variety of Copeland AC compressor designs. If you’re in the market for a commercial or industrial AC compressor, Compressors Unlimited provides a full range of brand-new and remanufactured reciprocating compressors from Copeland. 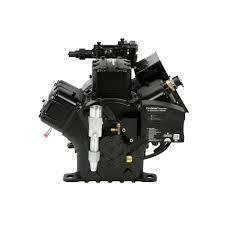 However, we always recommend opting for a remanufactured AC compressor instead of a factory-new unit, when possible. Compared to a new product, a remanufactured compressor utilizes existing or new components, which are upgraded to meet the current industry standards for performance and reliability. This basically means that a remanufactured Copeland AC compressor offers a greener solution, at a significantly lower price, and even more importantly, with no compromise on safety and quality. As our company strives to deliver enhanced customer satisfaction, we provide much more than dependable remanufactured compressors. As part of our ongoing effort to improve our customer service, we collaborate with all of our customers in order to supply the right remanufactured AC compressor, spare parts, and accessories that meet their unique requirements. Additionally, our remanufactured compressors are covered by a 12-month limited warranty against defects in materials and workmanship. HVAC system failure can end up costing you a lot of money. Although a quick fix might seem like the best solution at the time, it’s important to take into account the long-term consequences for your business. One way to make the right decision is to consider all the pros and cons of HVAC emergency repairs. If specific signs of failure indicate that your HVAC system needs a compressor replacement, our customer support team is here to answer any inquiries you might have and to help you select the exact remanufactured AC compressor you need. To find out more information about the Copeland AC compressor models we make available, please feel free to call our experienced staff today at 972-286-2264. ©2019 Compressors Unlimited, LLC. All Rights Reserved.